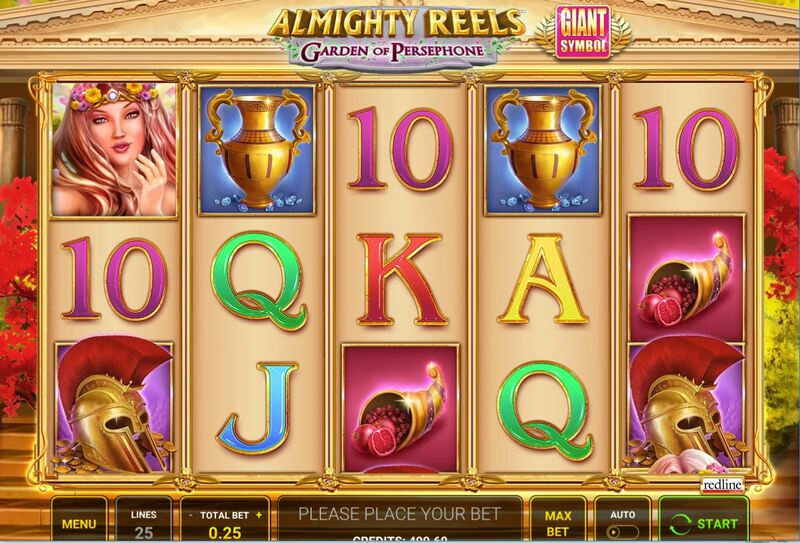 Almighty Reels Garden of Persephone slot is the second in Novomatic's Almighty Reels series following Realm of Poseidon. It seems to be their strategy now to have linked games as we have only just seen a pair of Tales of Darkness games with Lunar Eclipse and Break of Dawn as the two titles. Ancient Greek Mythology is the theme here so the reels are set over an Acropolis temple and spin silently with the usual Novo trotting sound as they stop with the occasional anticipation roll thrown in. Perspehone was the daughter of Zeus and goddess of the underworld, whose job was to bestow curses on the souls of the dead so let's hope she doesn't extend them to our bankroll too. 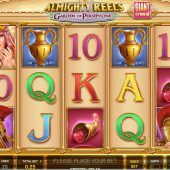 Almighty Reels Garden of Persephone has the standard format of 5 reels of 3 rows each with 25 paying lines in play. The icons are single usually but each spin one picture symbol aside from the Wild is selected as a colossal 3x3 icon which will spin on the centre reels. There are single Wilds on all showing the Acropolis the game is displayed over which don't multiply. Persephone is top pay at only 100 coins (4x bet) for a 5-of-a-kind followed by the Helmet at 80, Vase 70, Lyre and Horn 60 with the five card values present each paying 50 or 40 coins. You may be somewhat disappointed with the low pays above and to make up for this you will get a stacked symbol on reels 1 and 5 each spin which is the same as the Colossal one chosen. This makes the possibility of a full screen of a picture symbol each spin. If this does happen you would only get 100x bet for Persephone the top symbol. If a Wild or any part of the stacked symbol matching the Colossal one lands on reel 1 you get a slowed spin with dramatic music in anticipation of the Colossal one landing fully or partly in view. The tension is unbearable. You may have seen a Colossal Gold Coin scatter on reels 2, 3 and 4. You need to land this fully in view in all 9 centre positions to get 10 free games. Before they start the game randomly selects one of the 5 top symbols as the permanent Colossal 3x3 that will be on the reels for every spin. No retriggers are possible.